Meeting with the Guide by the main entrance of Herculaneum ruins. The ruins of Herculaneum, lying roughly 8 Km south-east of Naples, are most famous for having been destroyed, along with Pompeii, in the eruption of Mount Vesuvius beginning on August 24, AD 79. The town was buried under 75 feet (23 m) of ash deposited by a pyroclastic flow. It is undoubtedly one of the most impressive archaelogical sites in Italy. Ancient tradition connected Herculaneum with the name of the Greek hero Heracles ( Hercules), an indication that the city was of Greek origin. 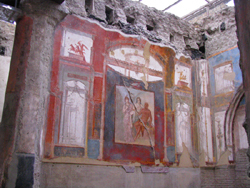 The most famous of the luxurious villas at Herculaneum is the Villa of the Papyri now identified as the magnificent seafront retreat for Lucius Calpurnius Piso Caesoninus, Julius Caesar's father-in-law. 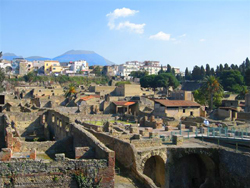 Much smaller than Pompei - about 5,000 people lived in the city at the time of the eruption, it was certainly wealthier and more select. Unlike Pompeii, wooden structures and furniture have survived. Out of the 20 hectars, which was the originally extension of the ancient town, less than a third has been brought to light so far. Many of the artefacts now are housed in the National Archaeological Museum in Naples, others in the local Antiquarium. 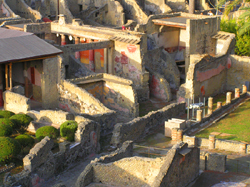 Herculaneum, once a seaside resort, is now surrounded by the modern city of Ercolano. THIS EXCURSION WILL OPERATE RAIN OR SHINE, SO BE PREPARED FOR ALL WEATHER CONDITIONS. 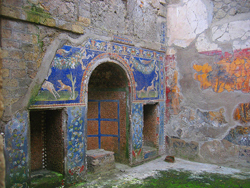 THIS TWO-HOUR EXCURSION IN HERCULANEUM RUINS COSTS EURO 150. ENTRANCE FEE IS NOT INCLUDED.